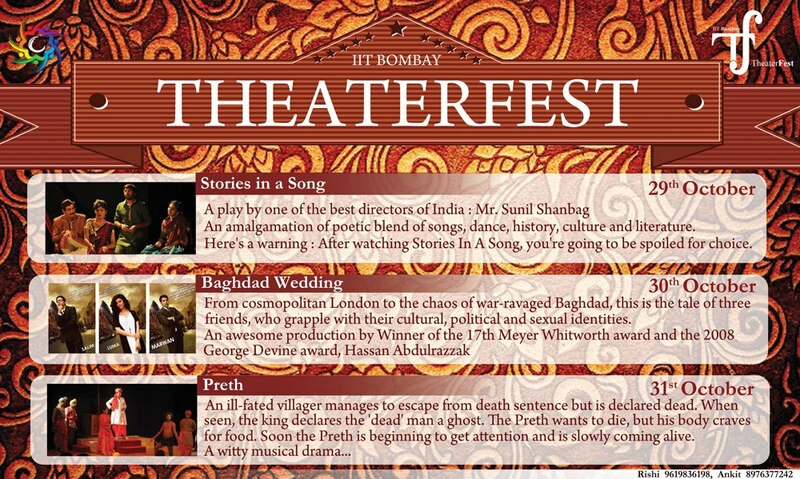 The annual Theatre festival of IIT Bombay is going to be held on 29th 30th and 31st October . With the venue being the newly renovated , Grand Convocation Hall and the play lineup boasting of names as impressive as highly reviewed Stories in a Song and much awarded Baghdad Wedding the Festival promises to be Bigger, Better and a much more enjoyable affair than ever. Keep watching this space for more information and detailed reviews of the plays. This entry was posted in Home, TheaterFest. Bookmark the permalink.